At Borthwick Jewelry, Inc. we provide you with a Jewelry Care Guide that will help your jewelry last forever. There are many things you can do to prevent jewelry from getting damaged. Wear your jewelry in the shower because the hot water from the shower helps keep you jewelry clean but remember to take any silver jewelry off when you are swimming because the silver will tarnish in the pool water. 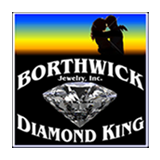 Bring your jewelry to Borthwick Jewelry Inc. regularly to have it checked for wear to prevent further damage. When storing jewelry avoid putting valuable jewelry in your jewelry box on top of your dresser. Also avoid hiding valuable in your lingerie draw. It is best to wear your jewelry, and possible get a safety deposit box. We recommend not storing your extra jewelry in your bedroom, especially if you are having a barbecue or party. You never know who might roam in when they smelll those cheeseburgers grilling. friends relatives might just think he's another friend. During parties and events wear your jewelry. If you have too much to wear please secure jewelry in a safety deposit box or secret location as mentioned above.